This Olive Oil Article explains what olive oil is and what the differences are among the various kinds. This article is provided in part by Kelly Martinez, Managing Director of "Antonio Celentano Extra Virgin Olive Oil" in Spain. ‘Olive Oil’, ‘Virgin’, ‘Extra Virgin’, ‘Light’, ‘Pure’ - Is there a difference? If so, does it matter? Which is better? Are all olive oils ‘extra virgin’? What is ‘extra virgin olive oil’? What is ‘Olive Oil’? Olive oil is olive juice, plain and simple. 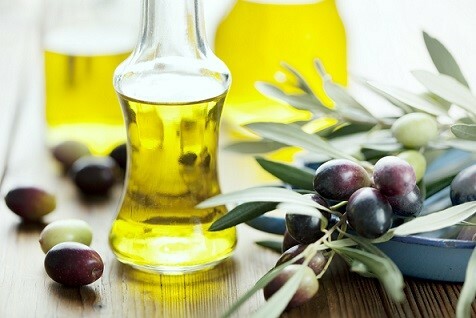 Olive oil is a fat obtained from the olive. What is ‘Virgin?’ Virgin means mechanical extraction. The oil or juice is extracted by machines with no chemicals used in the process. What is ‘Extra’? Mechanically extracted (virgin) olive oil is not all the same quality. 'Extra' is the highest quality and is thus classified because it goes through a battery of tests, both laboratory (analytical) as well as 'taste' (an olive oil master tastes the way wines are taste tested). Virgin olive oil that is judged to have ‘no defects’ is classified as extra. So ‘extra virgin’ means – mechanically extracted olive juice that passes laboratory and taste testing with no defects. Olive oil with slight defects, but that is still good for human consumption is classified as ‘Fine’. Low quality oil with numerous defects is classified as either ‘Ordinary’ or ‘Lampante’ (lamp oil). This oil is either used for industrial purposes or is chemically refined. What is ‘refined’ oil? Olive oil that is not suitable for human consumption is refined by a heat and chemical process. Chemically refined oil is totally insipid (0% acidity) which means it is flavorless and no quality standards stated or implied. Refined oil is mixed with virgin for color and flavor. What is ‘pomace’ oil? Pomace is produced by a heat and chemical process from the waste of the virgin olive oil after the virgin olive oil is extracted. It is also insipid (0% acidity) with no flavor and no quality standards stated or implied. Pomace is used as a cheap alternative to ‘refined’ olive oil in order to lower the product cost of the packers who mix it with virgin and refined oils. What is ‘pure’ olive oil? What is ‘light’ olive oil? What are ‘olive oil blends’? 'Pure', 'Light', 'Extra Light', etc. 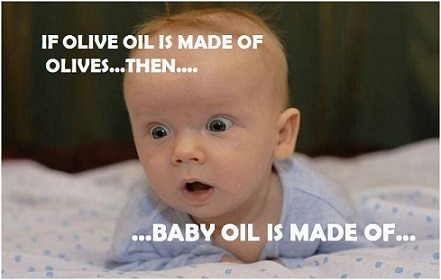 are not olive oil classifications. They are mixes of refined and/or pomace with virgin oil. Mixes (or blends as packers like to call them) are generally 90-95% pomace/refined with 5–10% virgin oil. Some packers mix in seed, soybean, hazelnut or other oils. Is there a difference between extra virgin olive oil and the refined oil mixes? Yes. They are two entirely different products. Refined mixes are cheap to produce. Because they are sold at a premium price the mixes benefit the seller more than the consumer. 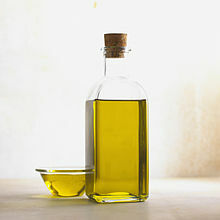 Extra virgin olive oil is an entirely natural product and is more expensive to produce. Extra virgin olive oil is much better tasting than the refined mixes and provides all of the health benefits that are associated with olive oil. I hope you found this olive oil article informative and interesting. Did you know? Evidence shows that olives were turned into olive oil by 6000 BC and 4500 BC in present-day Israel.